Traditional makeup sponge may lead to flawed makeup application, wasted cream absorbed by the sponge and messy residue! Our silicone puff can help you solve these problems, no more absorbed cream or messy residue. Just try it and create a flawless, airbrushed makeup application! Perfect for applying foundation, blush, highlighter, concealer, cream and powder, helps you to create flawless and airbrushed makeup. 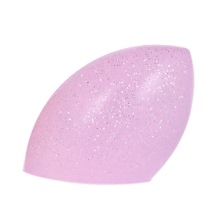 Mini size is so flexible in applying every part of your skin, including the eye corner, nose wing and mouth corner. Easy to use, simply apply a small amount of cosmetics to the silicone puff and then softly blend, won&apos;t absorb cream. Simple to clean and quick to dry, just clean with water. Portable figure, convenient to take it for beautiful trip.